Here is what I had, clockwise: Sea salt, some 4 day old cooked quinoa, sesame oil, hemp seeds, garlic powder, onion powder, and fresh rosemary from the garden, half a tub of Balela from Trader Joes (SO good! ), pistachios, a couple Tbls. 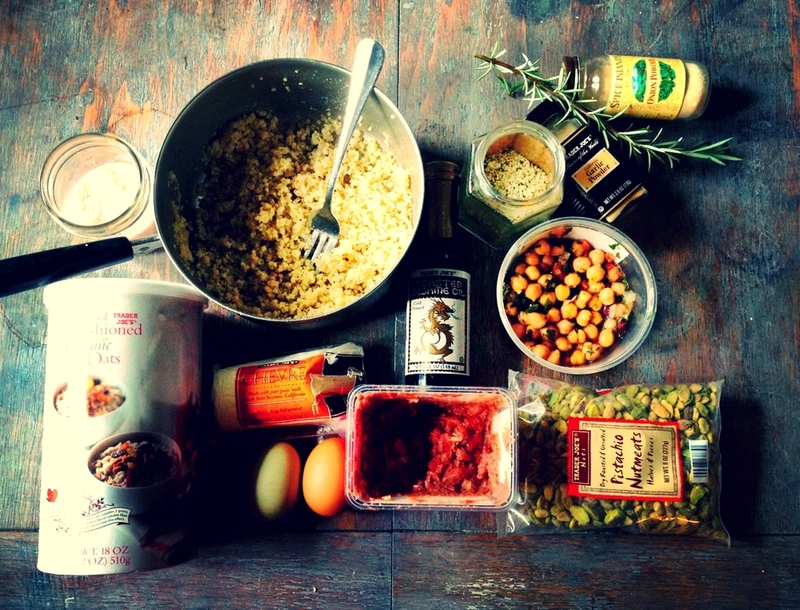 of sauteed pinto beans with tomatillos, eggs, chevre, and oats. This is just a list of what I had - feel free to substitute and omit as you will. This recipe would work without the cheese, and you could swap out with any bean in your pantry. Just play around with what you have and get creative, as long as you don't get too freaky it should basically turn out ok. 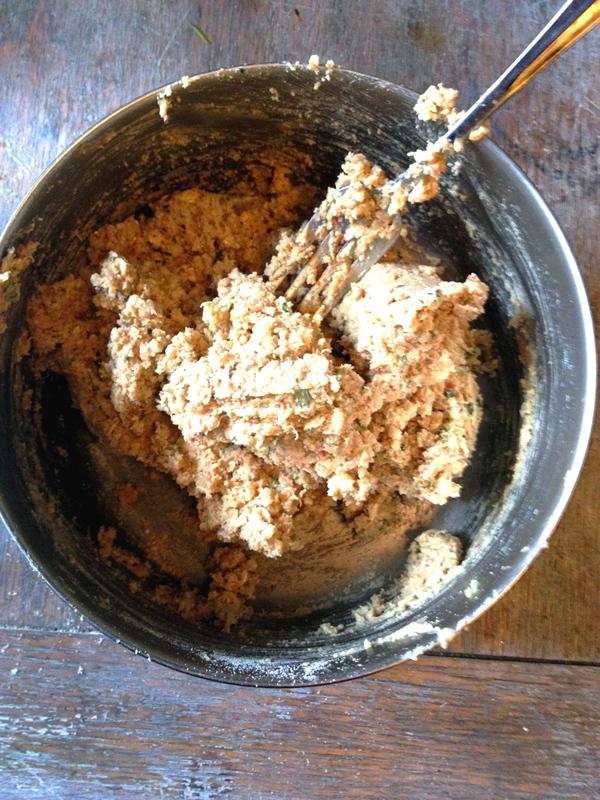 I also wound up adding some nutritional yeast and coconut flour later to help bind it together. I am not a huge fan of measurements, I like to fly by the seat of my pants, so I'm gonna give you more of a end goal: you want the end mixture to stick together pretty well, not fall apart, but not be too mushy. Kind of like a dry cookie batter. Luckily, if you find yourself with really dry dough or too wet dough, you can easily add ingredients to make it not so that. Yeah, that doesn't sound right to me either, but you know what I mean. Not so that. 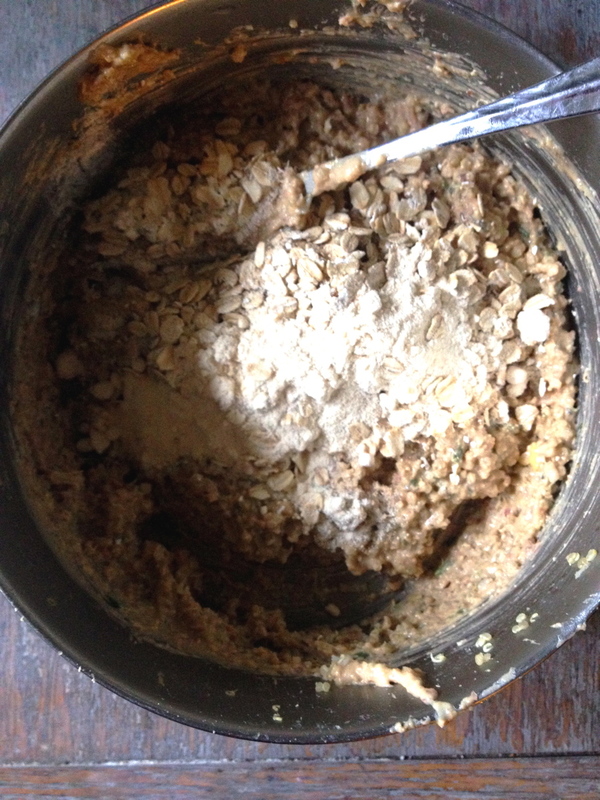 So I started off pulsing some of the dry ingredients in the food processor: the oats, pistachios, and hemp seeds. I added the Balela and beans and some sesame oil, and the mixture looked truly revolting, but smelled amazing. Then I added in the garlic, egg (I only needed one), nutritional yeast (about 2 Tbls. ), rosemary, spices, and chevre. It looked even more disgusting, if that were possible, but smelled even better. It was really creamy at this point. I mixed it into the quinoa, and it was still pretty mushy and not likely to hold its shape, so I added a little more oats, not ground this time, and also some coconut flour, which really helped. You could use any flour you happen to have on hand, gluten-free or gluten-fabulous, your choice. At this point I had a few hours 'til dinner, so I stuck the bowl in the fridge to let the flavors marinate. To serve it: I threw some Irish cheese on top, put in on a thick slice of crusty, whole grain bread, added some yellow chard and sorrel leaves for a lemon-ey flavor, then topped it off with a bit of pepper oil and sesame seeds. A few hours later, I was ready to cook. You can either bake them, grill them (this might be a bit hard - you might need to pre-bake, then grill), or fry them up. I decided to fry mine up in a bit of ghee (click here for some of ghee's nutritional benefits - it has a great flavor and has a high smoke point). I made a bunch, and whatever we don't eat in the next day or two I can freeze for later. Bonus: these patties are high in protein, fiber, and healthy fats, gluten free (if you use certified gluten free oats), sugar free, and can easily be made vegan by omitting the cheese and using flaxseed and water or oil in place of the egg. The final verdict: a total success. They were crunchy on the outside, warm and soft on the inside, and had a great flavor that would go with anything.